One of the first new mass production model mobile suits developed by the Earth Federation Forces following the One Year War, the RMS-106 Hizack is closely based on the old Zeon MS-06F Zaku II used during the war. However, it does incorporate modern design features tested in the YRMS-106 Hizack Pre-Production Type. Protected by lighter titanium alloy/ceramic composite armor, the Hizack's solid weight is greatly reduced, allowing it to carry larger-capacity fuel tanks and more powerful thrusters to take advantage of the extra fuel, with the result of greater speed and mobility. The Hizack is also the first mass produced unit to incorporate the new 360-degree panoramic monitor with linear seat style cockpit. The Hizack proves to be a popular model among pilots, as it is easy to operate and maintain. Its only major drawback, however, is the fact that its power generator isn't good enough to allow it to effectively use multiple beam weapons. 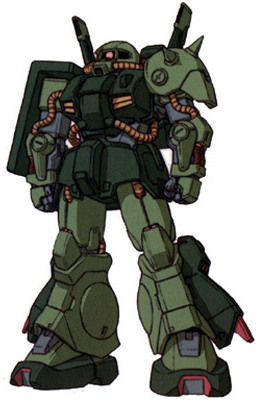 Despite this, the Hizack was one of the most heavily mass produced units found in the field during the Gryps Conflict, and its design served as the basis for many future mobile suit models.